I finally got around to buying tiles and getting them installed in the fireplace. I LOVE the way this looks. //assets.pinterest.com/js/pinit.jsWhen we first purchased the house there was a giant faux brick mantle with an even more giant mirror glued to the wall over the mantle. There had clearly been a fireplace here but somewhere down the line it had been removed and used as a vent for the hot water heater pipes. Since our house is trapezoid in shape this large space looked very awkward. We decided to embrace and highlight the awkwardness of the angle by installing an old mantle. We meticulously measured the space and carried around the measurements everywhere we went. One day we stumbled upon a large mahogany mantle at a thrift store in Philly. We immediately bought it! Since Scott installed it something didn’t seem right about it. It just seemed really big and the space inside (which would have consisted of the fireplace) just seemed bare. As a temporary fix I filled it up with books which looked great. However, piling the books on top of each other was damaging the books and it was a huge magnet for dust. 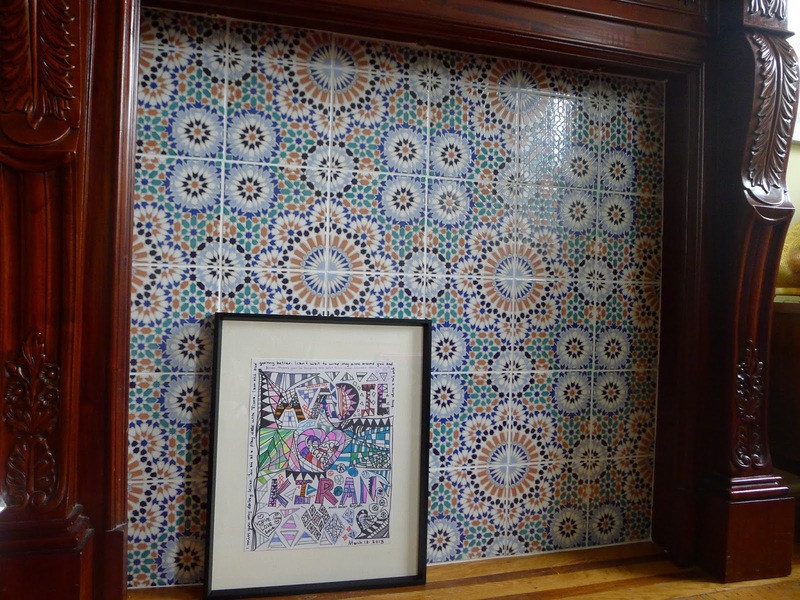 Finally, we got around to buying some Moroccan cement tiles and getting them installed. I couldn’t be happier at how the mantle turned out. Side Note: The drawing in front of the mantle is by Kiran and me and it is waiting to be hung in the dining room. Since most of our walls are plaster I can’t just hammer in a nail. I have to instead beg and plead with Scott to drill another hole for me in one of the plaster walls that he laboriously repaired. « Sick of Being Sick!